The US military has proposed diversifying its Nuclear Arsenal and developing new, smaller atomic bombs, largely to counter Russia. The latest thinking was revealed in a Pentagon policy statement known as the Nuclear Posture Review (NPR). The US military is concerned Moscow sees US nuclear weapons as too big to be used - meaning they are no longer an effective deterrent. Developing smaller nukes would challenge that assumption, it argues. Low-yield weapons are smaller, less powerful bombs with a strength below 20 kilotons. They are still devastating, however. The atomic bomb dropped on the Japanese city of Nagasaki at the end of World War Two had about the same explosive power, and killed more than 70,000 people. "Our strategy will ensure Russia understands that any use of nuclear weapons, however limited, is unacceptable," the document said. US Deputy Secretary of Defence, Patrick Shanahan, said the country's nuclear arsenal had kept it safe for over 70 years. "We cannot afford to let it become obsolete," he told a media briefing in Washington. It is the first time since 2010 that the US military has outlined its perception of future nuclear threats. The proposed "tactical" nukes would not increase America's arsenal, which is already considerable, but would repurpose existing warheads. Nonetheless, critics have accused the Trump administration of challenging the spirit of non-proliferation agreements. The NPR also highlights the White House's concerns about North Korea, China and Iran. Good insurance, or a step towards nuclear war? For the Trump Administration the goal of this review is to modernise and adapt the US nuclear arsenal for unsettled times. The three main elements of America's nuclear forces - Land-based ballistic missiles, submarine-launched missiles, and air-delivered weapons - are to be extensively modernised. These are programmes which actually began under the Obama Administration. What is new is the perceived need for two new types of nuclear weapons to provide - in the words of US officials - "more flexible capabilities to give tailored deterrence". 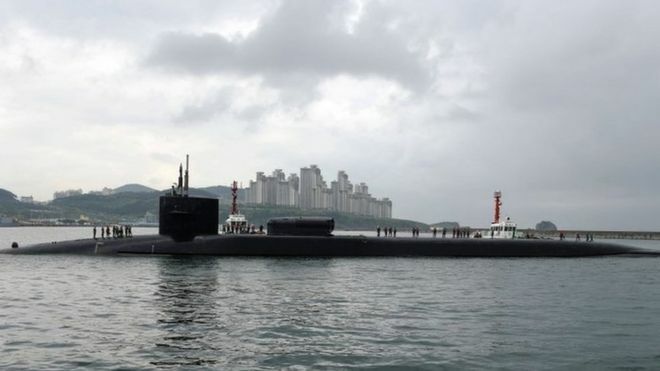 These include the modification of some submarine-launched nuclear warheads to give a lower-yield or less powerful detonation, as well as bringing back sea-based nuclear cruise missiles. US officials insist that this makes the US deterrent more credible and thus actually raises the nuclear threshold. But critics worry that such weapons could blur the distinction between nuclear and non-nuclear systems, and actually make a nuclear war more likely.